Manila, Philippines (CNN) -- Quietly cutting through the chronic traffic of Manila, the sprawling capital city of Philippines, is a fleet of brightly colored electric vehicles. 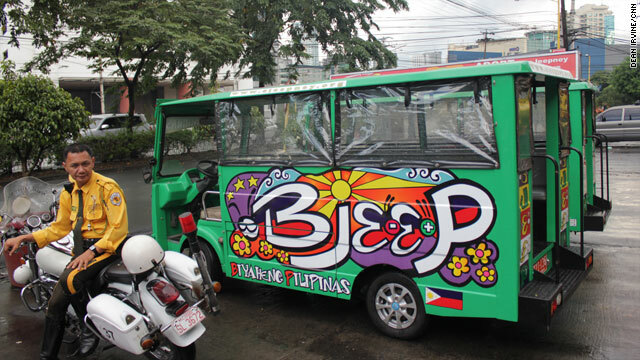 Can these e-jeepneys -- eco-friendly versions of the iconic Philippine form of public transport -- lead the country towards a clean, green future? Red Constantino believes so. He's the Executive Director of the Institute of Climate and Sustainable Cities, the NGO behind the 20 vehicles currently driving around the area of Makati. "The project was crafted as an element of an integrated program," he said. "The whole idea was to create a full loop: create energy from waste without burning it, capture the methane, and transform it into electricity which will then power the vehicles. Something that is very replicable that other cities can see and improve on." Rise of the electric car? We didn't think that the challenges lay in the technology but in the application. It means the charge time and range of the vehicles are not as impressive as electric vehicles powered by lithium-ion cells; e-jeepney top speeds aren't more than 30 kmph and full charging can take eight hours. But waiting for more expensive and efficient technologies to come down in price wasn't as important as simply getting an effective project up and running, believes Constantino. "We didn't think that the challenges lay in the technology but in the application," he said. "It took us that long just to get registration plates because the papers required (the vehicle) to have a tailpipe and an engine number which electric vehicles don't have, and so on and so forth," said Constantino. "The next stage was to prove technological viability and function normally and by normal people." Constantino says that passengers and drivers of the old diesel-powered jeepneys have been very supportive. The e-jeepneys have been full on the routes they run, he says (possibly in large part because they are free), while initially skeptical, jeepney drivers would ask questions about how well the new electric variety would fare driving through flooded streets -- a common hazard in the tropical city. The main roadblocks to electric vehicles won't be from commuters or drivers, says Constantino, but a lack of private enterprise and funding opportunities. Sparked by a recent proposal by the Philippines Department of Environment and Natural Resources to reduce the pollution in Metro Manila by 30% in 2011, the Asian Development Bank (ADB) is supporting a project to make the city's tricycle taxis eco-friendly. "I believe this is going to be a game changer," said Sohail Hasnie, the ADB's Principle Energy Specialist for Southeast Asia. The ADB's plan is to start small but quickly grow in ambition. Powering the nation's 3.5 million trikes by clean, renewable energy would stop 10 million tons of CO2 currently being emitted each year, according to the ADB. Elsewhere Edward Hagadorn, mayor of Puerto Princesa, the capital city on the island of Palawan, is also looking to turn all the city's tricycles electric by 2013. "The same solutions apply to bigger cities, like Manila, it's just about putting in your political will and then getting the community to agree and support the program," he said. The ADB funded tricycles will have lithium-ion batteries, and Hasnie describes the widespread use of the lead-acid variety as used in the Makati e-jeepneys as an "environmental disaster." Constantino is similarly skeptical of some of the ADB's plans suggesting "they are pulling things in a different direction" by providing sizable grants to small projects that could make electric vehicles seem like gimmicks. "Electric vehicles are here to stay, so long as they are intended for public application they will endure and expand."